A record release of 33 CubeSats from the International Space Station ended Friday after a methodical series of deployments of miniature Earth imaging satellites for San Francisco-based Planet Labs Inc. The CubeSat constellation, released in pairs over a 17-day period, included 28 satellites for Planet Labs and five spacecraft for private engineering research firms and institutions in Lithuania and Peru. The deployments began Feb. 11 as the CubeSats sprang out of pods mounted on the end of the space station's Japanese robotic arm. The CubeSats were launched to the orbiting complex in January inside an Orbital Sciences Corp. Cygnus cargo craft. Astronauts transferred the payloads, sealed inside more than a dozen NanoRacks deployers, to the space station's Kibo laboratory and through an airlock to the vacuum of space. 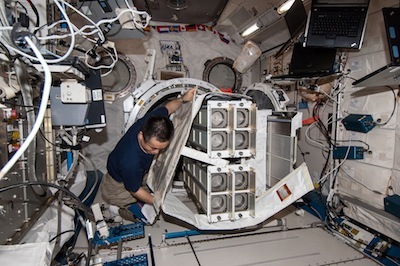 NanoRacks LLC, a Houston-based company providing commercial research opportunities on the space station, sponsored the CubeSat deployments for Planet Labs and other customers. Spaceflight Inc., a firm specializing in launch services for small satellites, partnered with NanoRacks to provide the CubeSat launch opportunities. "This is the beginning of a new era in space commerce," said Jeff Manber, NanoRacks CEO, in a press release. "We're helping our customers get a two year head start in space. They don't have to wait around for a dedicated launch to space but can instead catch the next rocket to space station. We want to thank NASA and JAXA for being wonderful partners, as well as Spaceflight Inc., for their help with customers. Without these organizations, this couldn't have happened." The 28 CubeSats for Planet Labs will return imagery of Earth with a resolution between 3 and 5 meters, or between 10 and 16 feet. 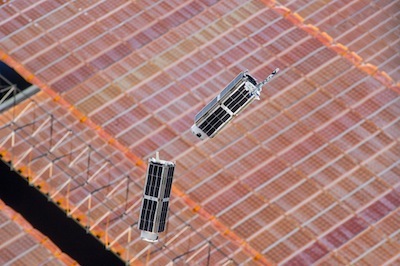 Planet Labs constructed the satellites, each about the size of a loaf of bread, at the company's San Francisco headquarters. The Planet Labs constellation, known as Flock 1, will monitor natural disasters, deforestation, agricultural yields and other environmental changes. The company says the satellites will allow scientists and the public to track changes to Earth's surface at an unprecedented frequency. It is the largest fleet Earth observation satellites ever launched. Because the satellites were deployed from the International Space Station, the Flock 1 constellation is limited to observing Earth between 52 degrees of the equator. The company was founded in 2010 by former NASA scientists and venture capital investors. Officials plan to upload imagery from the Flock 1 satellites for free access by commercial and humanitarian users.